Posted in FEATURED, THE ROOSTER CROWS AT 4AM! 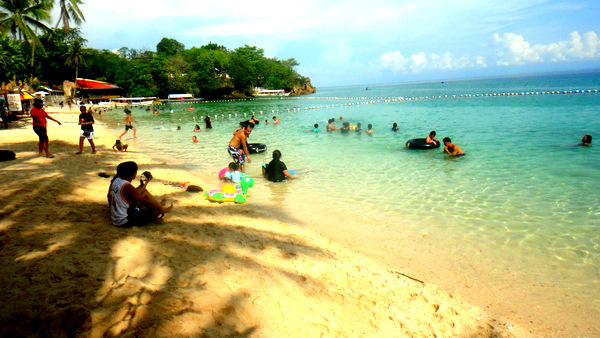 Raymen Beach Resort in Guimaras. Located in a stretch of white sand and turquoise waters called Alibihod, I’ve covered visits to this Philippines resort in past posts. Made another visit to this pocket of paradise on Mother’s Day. My asawa and relatives were accompanied by the son of Jesus, Mike (seen in the next photo closing his eyes), our neighbor that delivers our fresh drinking water. According to my asawa, Mike is our niece April’s “suitor,” a term used about 100 years ago in America. Noy Noy, Mike’s cousin (sitting next to Mike on the pump boat), also lives next door and came along for the Sunday holiday. The crew posed for the picture above at the main entrance. 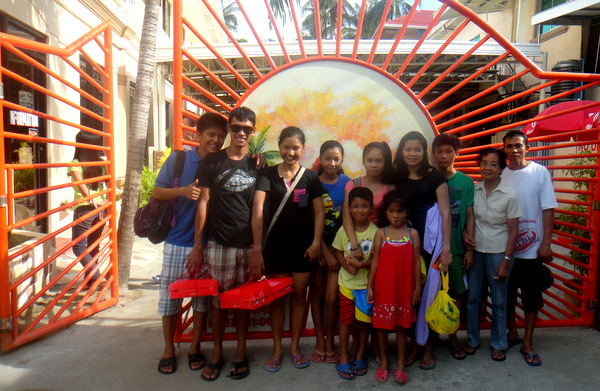 Except for our neighbors in Iloilo, the usual suspects were ready for some summer fun in the Philippines. Next to Noy Noy are our nieces April (her twin sister Michelle had to work at Savemore in Jaro that day), Den Den, Shaina, sister-in-law Alida, nephew Sharwen (who was 14 on May 19), Lola (grandma) and brother-in-law Joery. 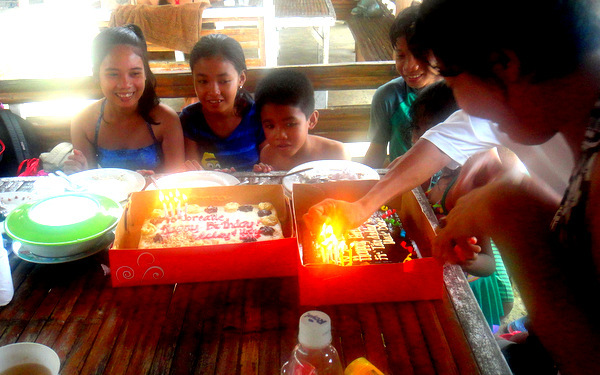 Up front is birthday boy, Jorreal, 7, and his sister, JalAmiel. 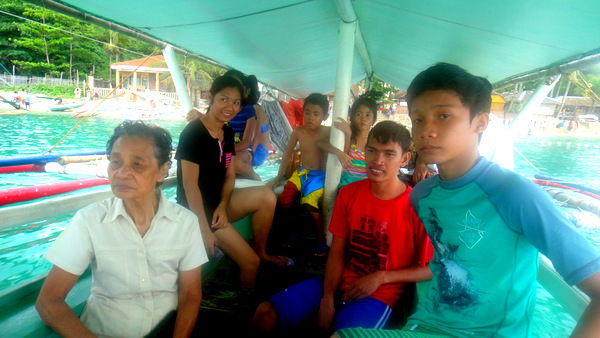 Raymen Beach resort in Guimaras was crowded that Mother’s Day. 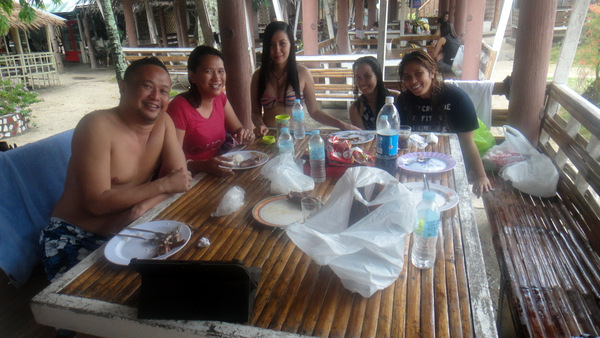 We arrived early, around 8:15 am, and reserved our P450 (about 11 US Dollars) nipa hut alongside the beach. 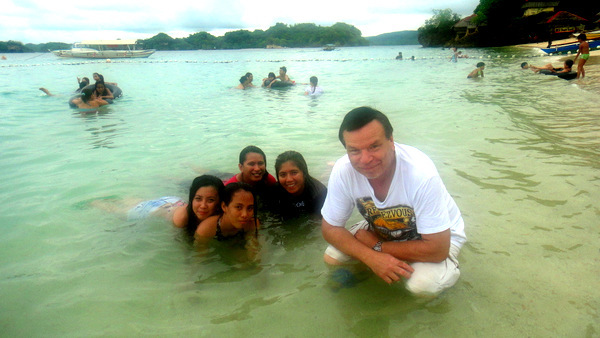 I posed with my lovely asawa, Melinda, before she went for a swim. I don’t swim. I can’t even float. My sole function at the Raymen Resort is to drink San Miguel Pale Pilsen, take pictures for this website, “Philippines Plus,” watch pretty pinays parade by, and meet new people at the beach. I had a few interesting conversations with some friendly locals and Koreans. More on them later in this post. Everybody was relaxing and getting ready to swim. My wife was smearing sunblock lotion on little JalAmiel. My brother-in-law Joery looks like he’s getting ready to take a nap and his wife, Alida, my sister-in-law, catches me snapping this picture. Lola, who rarely leaves the nipa hut, was out on the beach this Mother’s Day and had covered herself with sand after going for a swim. I have never seen my mother-in-law, The Giant Lizard Killer, go in the water until that day. My asawa informed me that my mother-in-law’s legs have always hurt her too much to go swimming but she was feeling well enough that Sunday to get out. 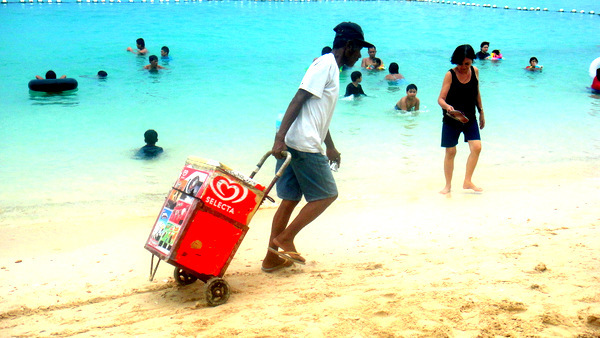 This is the Selecta ice cream vendor. Here’s a tip. Save yourself 10 pesos, 24¢, and buy your ice cream from the canteen located inside Raymen Beach. The vendor charges P40 for his ice cream treats. The canteen sells the same stuff for P30. Despite a two day election ban on alcohol sales, I had no problem ordering my beer. 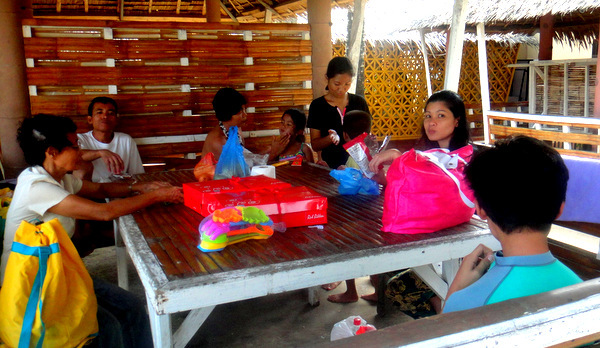 Filipinos at other nipa huts were also drinking Red Horse. I’ve discovered that a lot of Filipinos didn’t pay any attention to the various rules instituted by Comelec, the Commission on Elections in the Philippines. Not only was liquor openly consumed, but vote buying and the carrying of weapons, both banned, were also commonplace. Met some new friends (pictured above) that work at SPI Global, a call center located in Iloilo with offices throughout the Philippines. The friendly group invited me to drink Red Horse with them (which I did of course, didn’t want to be rude) and I chatted with them at length. Nice folks. Typical friendly Filipinos. “Thailand,“ one lady replied. “My friends are from Vietnam and Japan.” I was surprised that I had guessed their nationality wrong and apologized. And then I discovered, like Kim Jong Un, the North Korean dictator who welcomed Dennis Rodman into his country, South Koreans also have a sense of humor. The group was teasing me. Seems that everyone guesses their nationality and they decided to mess with this American expat. They were all Koreans. 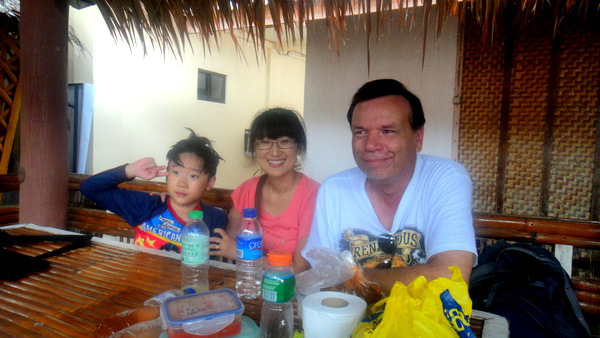 The lady seated next to me in the photo above, along with her son, who was wearing s Superman outfit, is staying in Iloilo for a few years to learn English. Her other Korean friends, including the prankster, have been in Iloilo at the Athena English Learning Center for two months and will be staying two or three months more. The rest of the crew members were too shy to have their photo taken. The joker, Theresa ( which she advised me was her Roman Catholic name) told me I should teach English at the center. I informed her that I was too lazy, I was retired, and that I didn’t need to. I later discovered from an American expat friend that the company pays P80 an hour (1.93 US Dollars.) Good wages in the Philippines, but I’m sincerely not interested in doing anything that involves being responsible and having a schedule. 30 years at AT&T was enough for me. 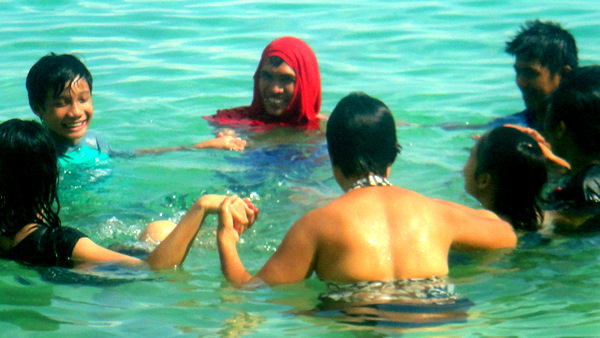 Michael, from SPI, took this picture of me on the beach with his Filipina friends. I know it looks like I’m squatting and getting ready for a dump, but I didn’t want to get completely wet since I didn’t have a change of clothes with me. Next post, the crew hops on a boat to do some island hopping off Guimaras. They take off (see next photo) and The Kano stays behind to drink some more beer. And watch cute Filipinas strolling on Raymen Beach. Maybe even find someone to tell my long-winded, oft-repeated stories to. We had planned to go on a Tuesday, PapaDuck, Michelle’s day off. But we had to scuttle that plan because Melinda had to take Lolo, her father, to the doctor in Iloilo. Lolo’s condition is unfortunately deteriorating and his dementia is getting worse, so we rescheduled the visit to Raymen. He’s currently on some prescribed medication but still trying to wander off in the middle of the night. papsduck so excited to visit again Ilo Ilo city. it seems very relaxing. have nice day. Always fun at the beach, Anne. Very relaxing. I don’t swim but I enjoy hanging out there with the family. They love it. We’re excited for your return, also. Melinda and I are both looking forward to it. Take care. Not sure the beach there is as good as the ones on Lake Michigan. At least you can drink lots of beer. Plus you can walk on water in the winter time on Lake Michigan!! !